Photography—it’s all about passion, skill, and commitment. Ever wondered what a day in the life of a photographer is like? Every week, we ask a photographer to document and share how they spend their day at work, giving you an exclusive, behind-the-scenes look at a pro’s shooting schedule. 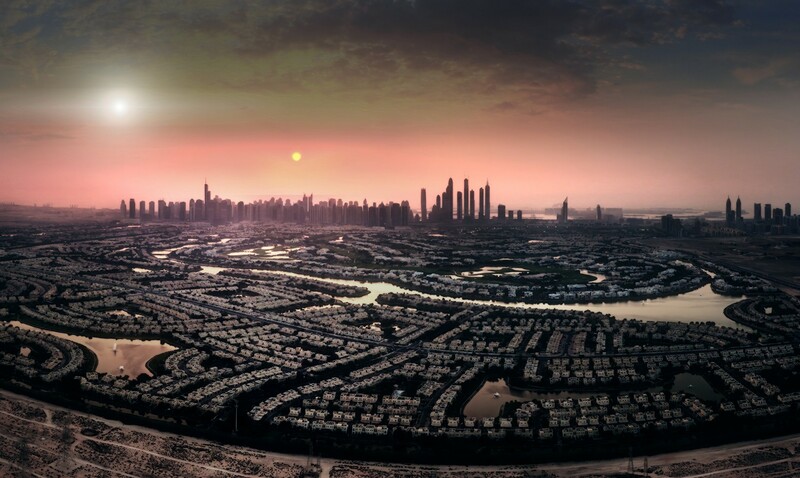 This week, we’re heading off to the races with Philip Platzer, an extreme sports photographer based in Austria. Read on for not just one, but FOUR action-packed days in his life! I am a 37-year-old sports photographer based in Austria. I have always been active in sports such as surfing, rock climbing, and snowboarding, but something was missing. I wanted to capture the dynamic and emotion of a single moment. I’ve always been interested in both photography and sports, so it made perfect sense for me to capture all these great moments and adventures. I started to shoot friends, and became addicted to photography pretty quickly. I don’t have any classic education or training—I am an autodidact. In 2009, I started to work as a pro photographer, and I’m happy it worked out for me that way. What I love most about my job is to create unique and never-before-seen images. In the last few years, I took a lot of jobs covering motorsports. 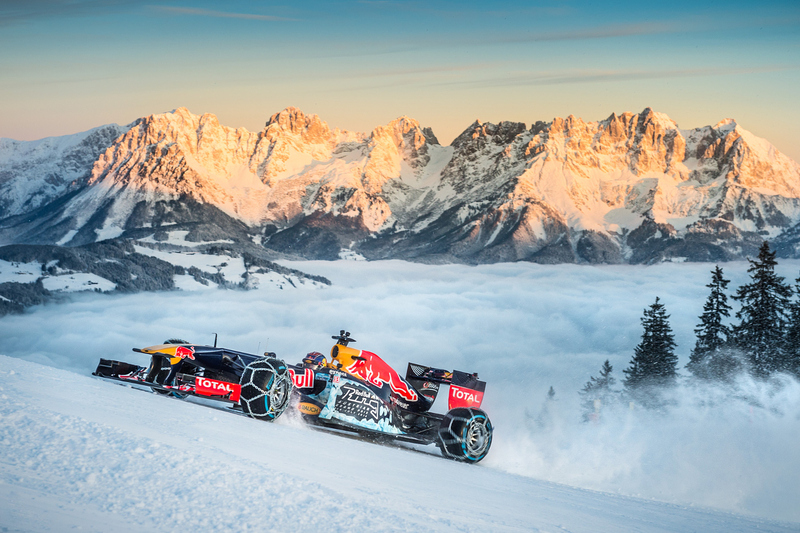 So when Red Bull asked me a few weeks ago to shoot an F1 car racing on a ski-slope, I didn’t think twice—I said, “Hell yes, why not!” But I was even more excited at the kind of slope that I was set to photograph. Of all slopes, this is THE ONE to capture! Welcome to the world famous Hahnenkamm! For those of you who are not familiar with downhill ski-racing, let me tell you that the Hahnenkamm Race is one of THE hardest downhill skiing races. 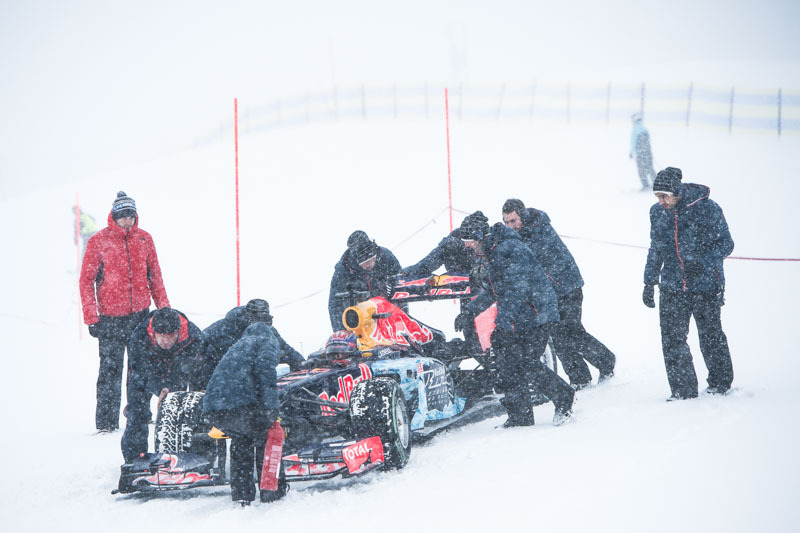 After hanging up the phone, my first thoughts were, “What am I doing?” and “How can this work?” Well, the crew had some proper issues to manage, but they made it happen, so off I was to Kitzbühel, right in the center of the Austrian Alps where the race takes place every year. DAY ONE, 6:30 P.M. I arrive in Kitzbühel, and we have our first meeting. Bad news—due to the bad weather forecast, everything that needs to be shot on Tuesday and Wednesday needs to be postponed for Thursday. So do I get a day off tomorrow? Not really. DAY TWO, 7:30 A.M. I am on my way up to the mountain inside the very first gondola. It’s freezing cold outside. Last night, temperatures dropped down to -15° Celsius! 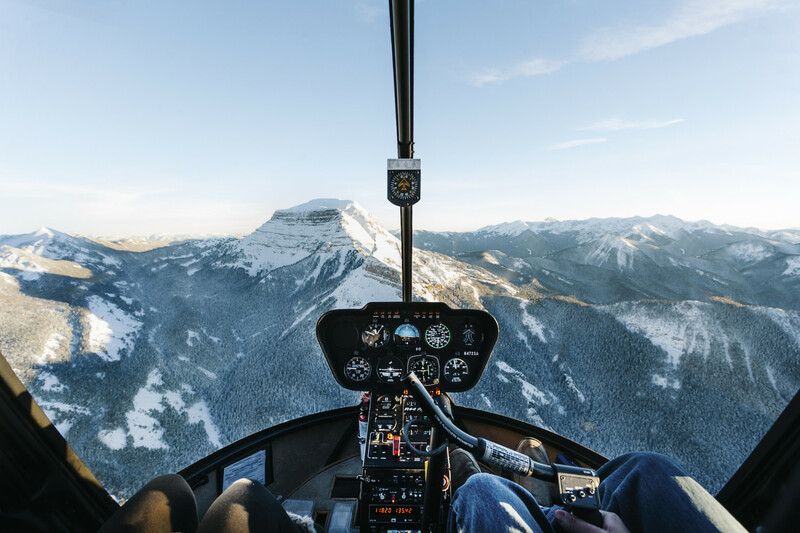 We are bringing the car up to the mountain early this morning because there is only a short time slot with good conditions for the helicopter to fly. 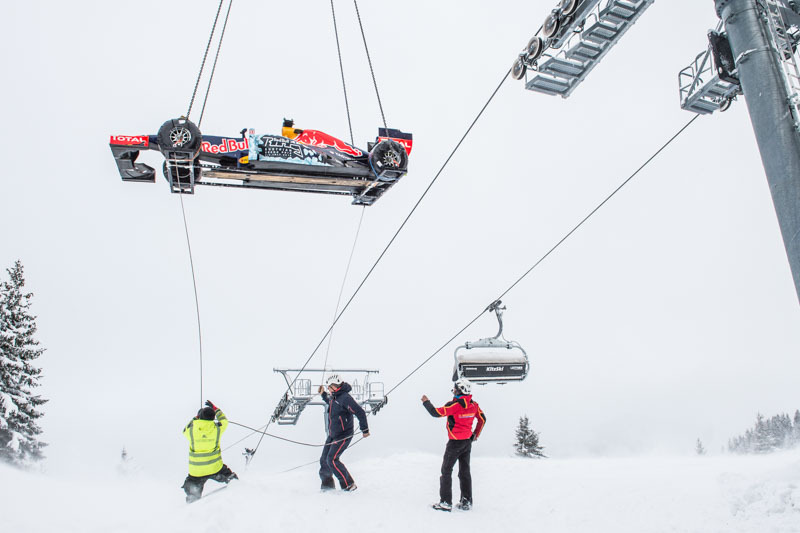 So if you’ve ever wondered how to get a F1 car up a hill, just get yourself a helicopter! 9:00 A.M. What an office! I’m sitting next to the operator of the chairlift in a small cabin on top of the slope. I’m doing some post-production on the helicopter shots I took earlier. The chairs of the lift are passing by every few seconds with a repetitive noise and more and more people are coming, as the chairlift has officially starts its operating hours. But it’s warm in here, and there is WIFI! I need to send the first shots of the day as soon as possible, so Red Bull can do the press release and announce the delay of the event. It is starting to snow again. The slope is now covered with some fresh and nice powder. Luckily the car is already up here, because the helicopter wouldn’t have been able to fly in these conditions. 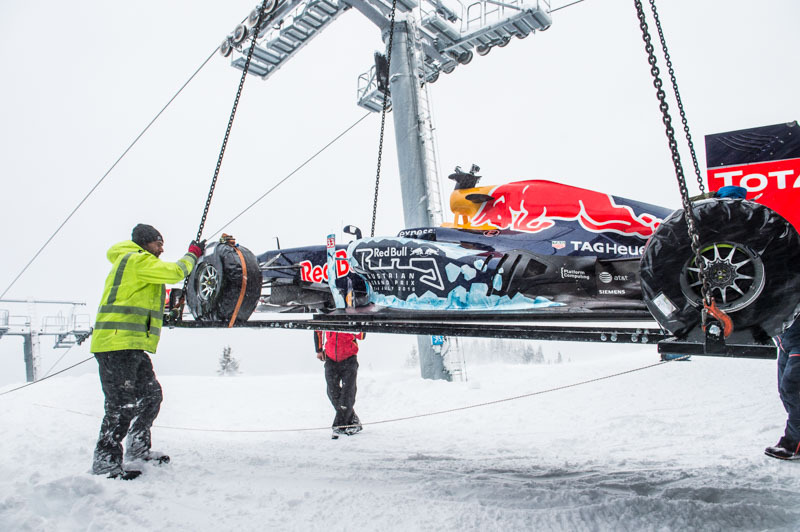 The skiers will enjoy the fresh snow, but for the RB7 and the whole project, it’s not the very best set-up. On my way back down for a late breakfast. 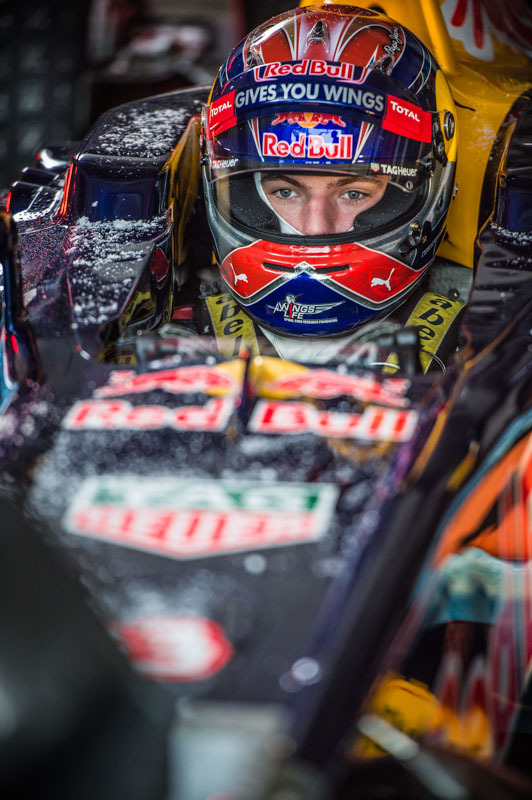 Up-and-coming F1 racer Max Verstappen arrives on the Mountain. I have already met him during other shoots a couple of times last year. Although he’s not even twenty years old, this young man is really professional and absolutely nice to work with. 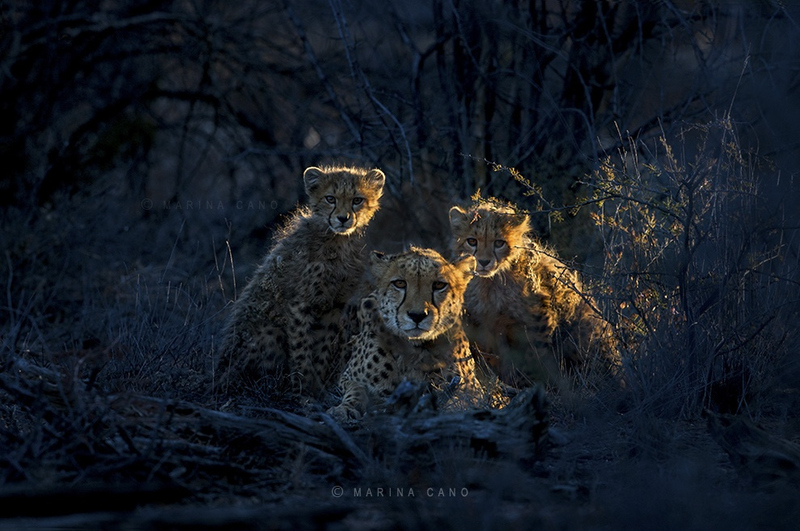 We are having a quick chat about how this is a great opportunity to get one-of-a-kind and unique shots. 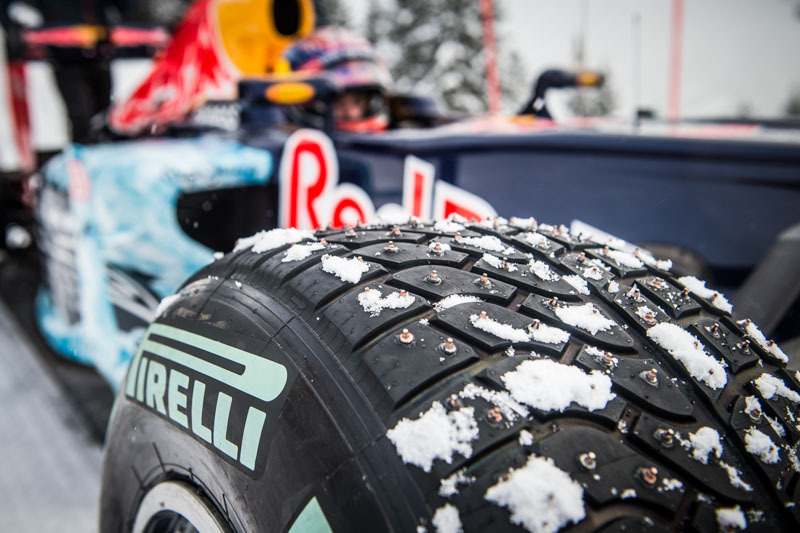 4:00 P.M. First test: Pirelli-built special spiked tires for the RB7. Let’s see how they work on the snow! I focus on some details and lifestyle shots. I will get nice action shots on Thursday anyway, hopefully. 6.00 P.M. This track is not very ideal. After this first rollout, plus checking the snow forecast for the next day, the team decides to go with snowchains. 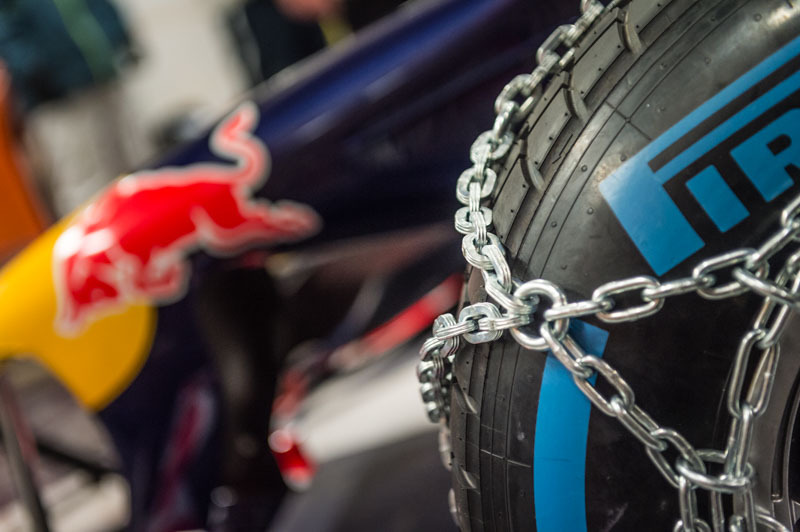 But where do you get snowchains for a F1 Car? 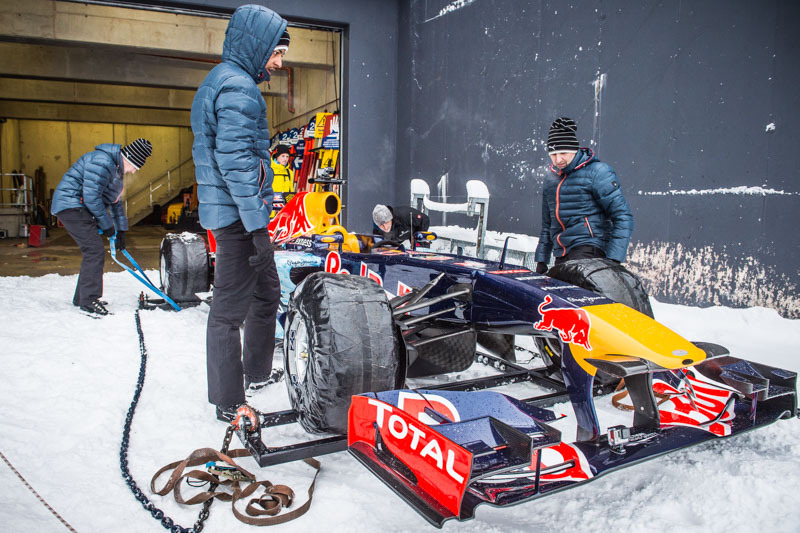 You can’t get them in a store—this is why the Austrian snowchain company PEWAG offered to build custom ones for Red Bull. 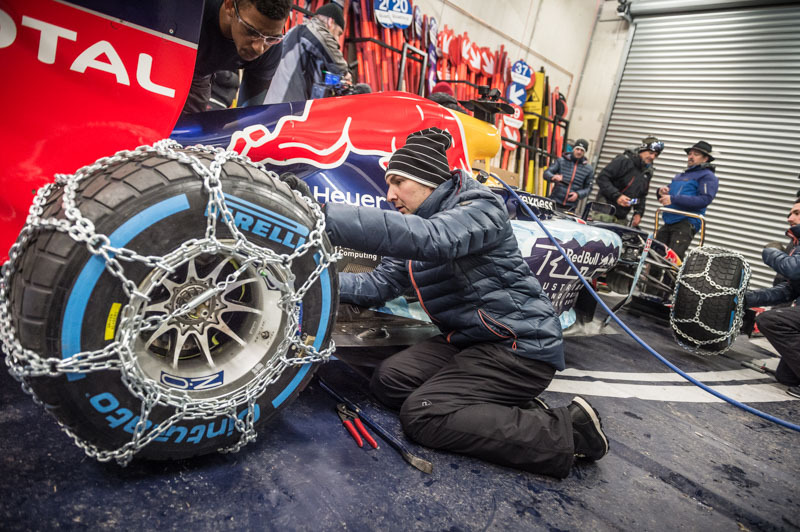 The only problem is, PEWAG has only 24 hours to check the tires, construct the chains, AND bring them to Kitzbühel, which is a six-hour-drive from the Styrian capital. There’s only one chance to make this event happen. After breakfast, I have some spare time to edit the lifestyle and detail images from yesterday. I’m also sending a selection of the images to Red Bull and Red Bull Racing’s social media team. We are also still waiting for the snowchains to arrive. 11:00 A.M. We are still waiting for the snowchains to come. The video production team took the morning to do some interviews and get beauty shots. So did I. It’s not always easy to work with the video team side by side. But you need to have a teamwork attitude to share the same lights and the space. 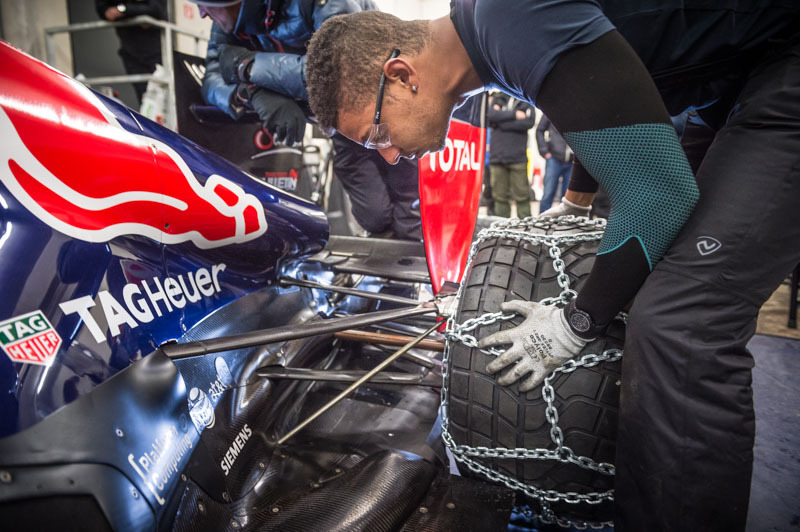 Even if there is no chance to get action shots because of the still-missing chains, I manage to get some nice lifestyle shots with Max and the RB7 in the garage. 2:00 P.M. The track is looking better! But there are still lots of fresh snow Mother Hulda shakes out of her huge pillows. The team keeps trying, and pushes the car out and back on the snow again. 4:00 P.M. Waiting for the snowchains. 6:00 P.M. Still waiting for the snowchains! 8:00 P.M. And here we go! The snowchains finally arrive! But will they fit the tires? And will the tires fit the car with the massive snowchains on? Especially with the rear tires being pretty close to the chassis. At the moment, to me, it looks tricky. Everybody is nervous, and the team needs some space to work on the car, so I have to make sure not to disturb them. They are the priority. The film crew will need their shots. These are actually the moments where I pray for a superpower: Invisibility! 9:50 P.M. This is the first rollout of a F1 car on snowchains ever, and it might be the last time for a while after tomorrow’s showrun as well! I’m surprised how good it works. 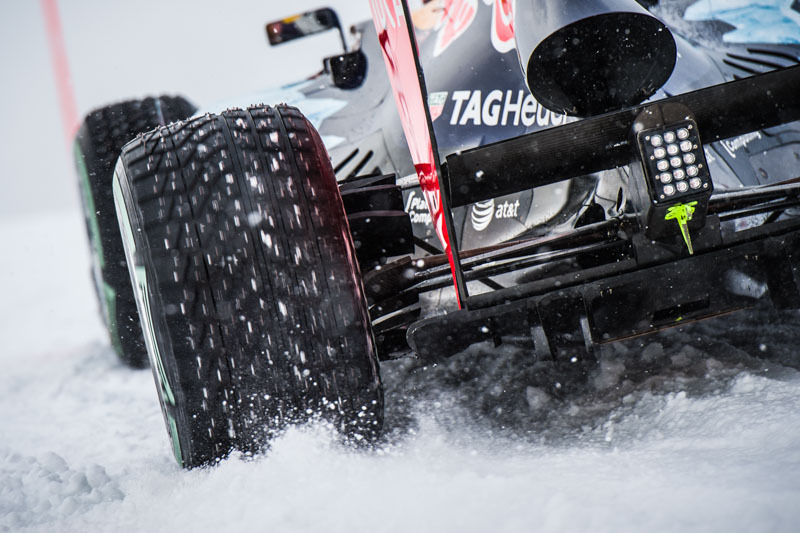 Even on the fresh snow (as it’s still snowing here in Kitz), it’s possible to drive and control the RB7. 11:15 P.M. I am having late dinner with the team, plus getting a quick briefing for the main event tomorrow. We will start really early at 7 A.M. on the top of Hahnenkamm, so no beer for me tonight. Okay, one. DAY FOUR, 6:30 A.M. It is still dark, but we are already sitting in the gondola. The sunrise won’t be until 7:45 A.M., so I am not sure about my positions yet. I need to decide what they will be, along with the light and backdrop. It’s pretty hard to decide when you can’t see anything. 7:30 A.M. I am on position, and ready for the first run of the beauty-shots. Max will do 3 runs and 2 laps each. There’s no time to cover a lot of different perspectives, so the shots have to be perfect! 8:30 A.M. No signs of the sunrise yet, but the cold light from the floodlights will create a warm sky and morning mood for the first shots of today. 9:00 A.M. I found THE spot! I’m still waiting for the second run, but the light is perfect now – and there’s some fog! I’m really satisfied with the setup. I’m crossing my fingers the light stays like this until Max hits the snow again. Some clouds can hide the sun sometimes. 9:30 A.M. I am super happy with the shots so far! 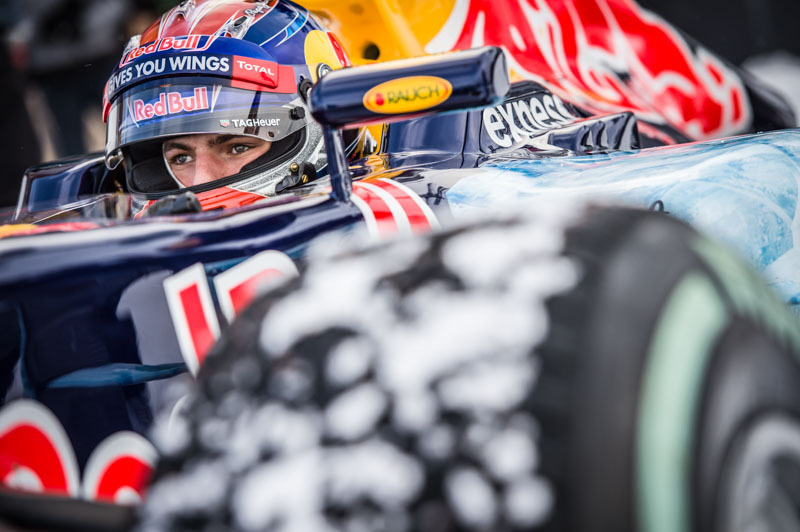 After the next run I have time till 11:00 to edit the first shots of Max in the RB7 on the track. 11:00 A.M. Time for the public showrun. The task is to get the spectators on the shots. I’m really pleased with the beauty-shots, so I can focus on the crowd during the run. This time, Max will do only 2 runs with 2 laps each. Lucky me—I found the one position to get some nice shots for catching different angles, without moving too much around. With only two runs, there wouldn’t be time for that really. 11:20 A.M. All done! The very last photo was the money-shot for the public showrun. It shows the whole event including the RB7, the crowd, the location, and last but not least, the amazing mountain backdrop—all in one image. I am really happy! 12:00 P.M. The last task for today is the press conference, just a few snaps to get some shots with Max, Dr. Helmut Marko (Red Bull Motorsports Consultant), and Gerhard Berger (former Austrian F1 driver) for the press release. 12:20 P.M. On my way back down the Hahnenkamm with the gondola, I get 10 minutes to start with selecting shots on the camera, instead of just sitting around relaxing. 12:30 P.M. Back at the office. I am selecting final shots to submit to news, social media, and the Red Bull Content Pool. The editing is quick and easy. No big challenges in Photoshop; just some basic corrections in Camera Raw. On events like this, the images should be online as fast as possible. 13:30 P.M. It’s Beer O’Clock! Time to relax, and enjoy the results and rewards of my busy last few days. I am really stoked about the outcome—another shoot is in the books! 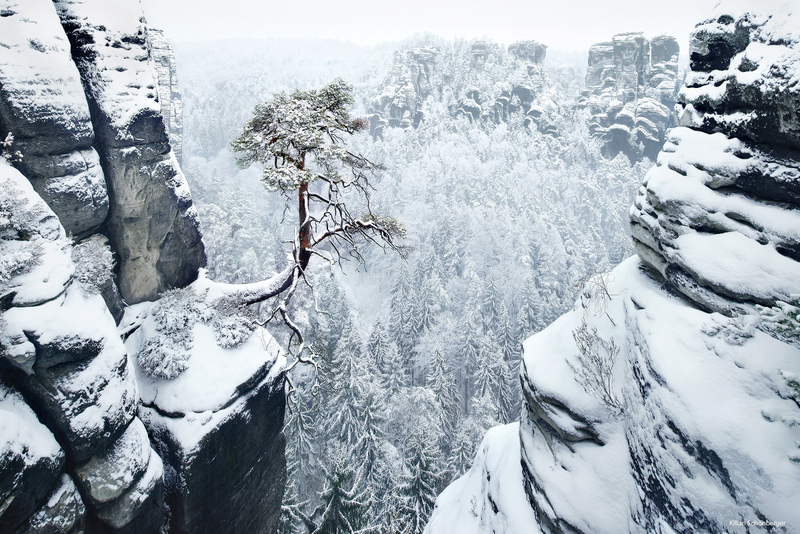 To see more thrilling photos, follow Philip Platzer on 500px, or check out the Red Bull Photography website. 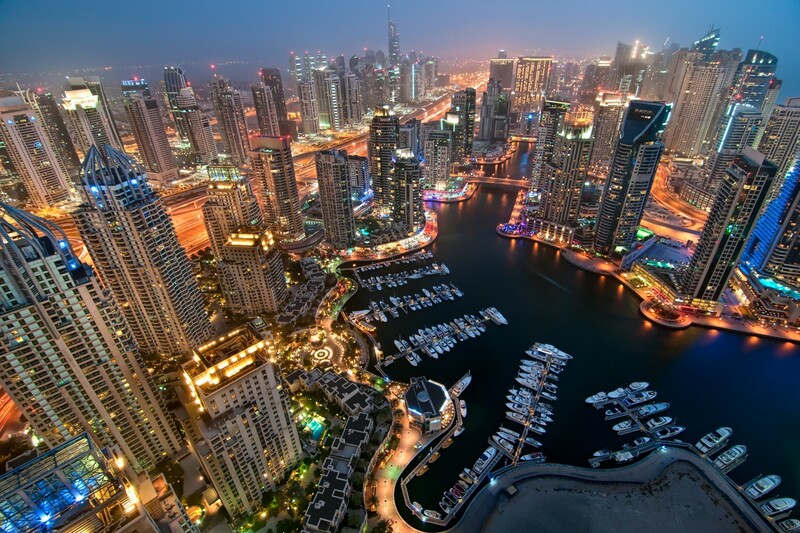 Got any questions for Philip Platzer about his shooting schedule, his process, or his images? Leave a comment for him below!